Explore a never-before-seen side of Out of Africa Wildlife Park while zip-lining overhead. No corners have been cut to bring you a unique adventure that combines the thrill of flight with breathtaking views and majestic animals below. 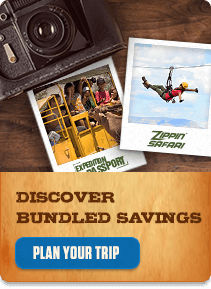 Experience the Predator Zip line, a high-flying adventure that explores a loftier side of the park – one that takes you over the grandeur of the safari park as wild animals underneath you elevates your experience. The Racing Raptor features three parallel lines, meaning you can zip alongside two of your friends as you whisk overtop majestic animals. Automated braking system means no experience necessary.